How adorable is this ‘Happy Baby’ cropped top?! I just ‘needed’ it! I cannot believe I’m already 31 weeks pregnant! Baby in Pearls will make her arrival in just two months! Part of me feels like I have been pregnant forever, and the other part of me feels like it’s going by so quickly! Unfortunately I have been sick throughout the pregnancy with nausea and extreme exhaustion. However, strangely enough I don’t mind being pregnant even though I have been sick. I love the fact that my little baby girl is inside of me growing. It puts the biggest smile on my face each and every time I feel her move or kick… it’s truly the most amazing feeling I have ever had. Now, let’s get on to my outfit! Like I mentioned previously, I like being pregnant. I love the feeling and I also love wearing clothes that show off the bump! Since I am growing like a weed, I am embracing more casual wear and this top had me at hello! She’s a happy baby already, I can tell with all of her kicks, rolls and movement — and you better believe I’m a happy momma already! This top is just too cute! I wore it causally with my go-to leggings. Would you believe I am wearing the same leggings I did pre-pregnancy?! They are just that stretchy… and that comfortable! I am obsessed with them! If you are on the hunt for really comfy and soft leggings that last for a long time I highly recommend getting these. 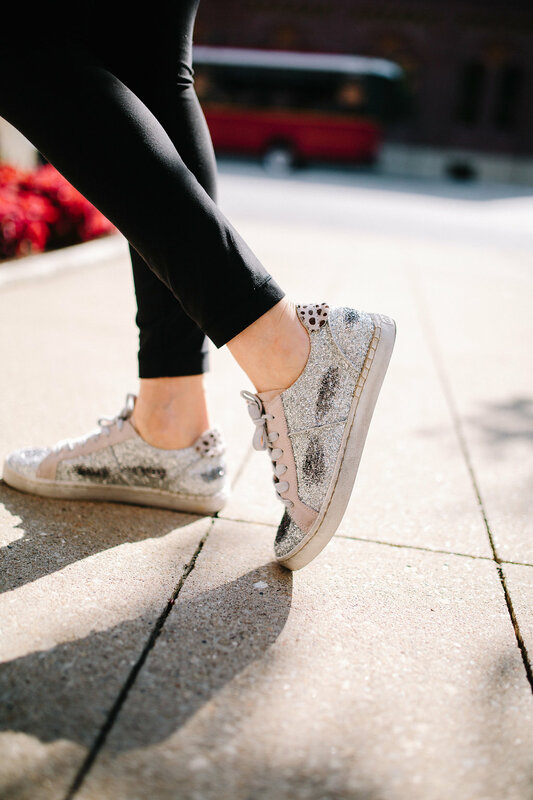 I jazzed up the look a bit with metallic accents and wore my most glittery kicks! They are so fun! Any mamas out there… what is your best piece of advice for me? I’d be so grateful for any tips, tricks or words of wisdom as I embrace motherhood.